Telangana Govt gives nod for recruitment to 1,863 posts in TMREIS: The government has asked the Executive Officer of the Telangana Residential Educational Institutions Recruitment Board to take necessary steps for filling up the vacancies through direct recruitment. The State government has accorded permission for direct recruitment to 1,863 vacant posts in the Telangana Minorities Residential Educational Institutions Society (TMREIS). The vacant posts include 1,280 postgraduate teachers, 354 Trained Graduate Teachers, 89 Junior Lecturers and 70 each Physical Directors and Librarians. To this effect, the State government issued an order on Friday. The government has asked the Executive Officer of the Telangana Residential Educational Institutions Recruitment Board to take necessary steps for filling up the vacancies through direct recruitment by obtaining details such as local cadres of the vacancies as per the presidential order, roster points, qualifications etc from the authorities concerned. The Minorities Welfare department and TMREIS have been asked to furnish details of all vacant posts including local cadre wise/subject wise vacancy position, roster points and qualification etc to the recruiting agency immediately under intimation to the Finance department. GOVERNMENT OF TELANGANA ABSTRACT - Public Services - Recruitment - Minorities Welfare Department - Filling up of eighteen hundred and sixty three (1863) vacant posts in Telangana Minorities Residential Educational Institutions Society (TMREIS) through Direct Recruitment - Permission to the Telangana Residential Educational Institutions Recruitment Board (TREI-RB) - Orders - Issued. 2. MW Department, U.O.No.4975/E.1/2018, dt.02.05.2018. 2. 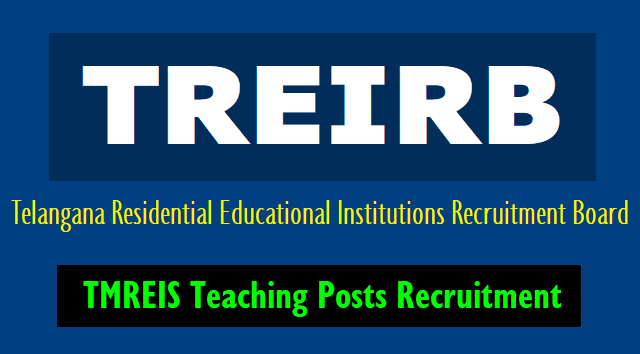 Government have reviewed the Direct Recruitment vacancy position in Telangana Minorities Residential Educational Institutions Society (TMREIS). After careful examination of the proposal furnished by the Department and keeping in view the actual requirement of manpower with reference to the nature of work and activities of the department and also the overall financial implications, Government hereby accord permission to fill up (1863) eighteen hundred and sixty three vacant posts in Telangana Minorities Residential Educational Institutions Society (TMREIS), through the Telangana Residential Educational Institutions Recruitment Board (TREI-RB) as shown below. 4. The Minorities Welfare Department and Telangana Minorities Residential Educational Institutions Society (TMREIS) shall furnish details of all vacant posts authorized in this order, including the local cadre wise / subject wise vacancy position, roster points and qualifications, etc., to the recruiting agency immediately under intimation to Finance Department. The Department shall issue necessary amendments to their service rules / Byelaws /Government Orders changing the existing recruitment procedure / recruiting agency, wherever necessary.